Antabuse (Disulfiram) is used in the treatment of chronic alcoholism. It is not a cure. Antabuse (Disulfiram) may be described as a white to off-white, odorless and an almost tasteless powder. This medication dissolves in water to the extent of about 20mg in 100ml and in alcohol to the extent of about 3.8mg in 100ml. Antabuse (Disulfiram) must be swallowed with a glass of water or it can be crushed and mixed with any other type of liquid. Take this medication exactly as directed and be sure to consult your health care professional pertaining to the use of this medication in children. Do not suddenly discontinue this medication without prior confirmation from your health care professional. It is important for the patient to know that before consuming Antabuse (Disulfiram), they must inform their health care professional if they have ever had a history of, or are currently suffering from, psychiatric complications, heart, kidney or liver complications, recent exposure to alcohol or seizures. It is also important for the patient to know that before consuming Antabuse (Disulfiram), they must inform their health care professional if they have ever had a history of or are currently suffering from under-active thyroid, various blood complications or diabetes. Furthermore, while on an ongoing course of Antabuse (Disulfiram) it is necessary for the patient to avoid consumption of beer or wine, usage of aftershave lotions, mouth washes or colognes. Lastly, avoid inhaling paint fumes, products that contain organic solvents, and alcohol based toiletries and perfumes. Before consuming Antabuse (Disulfiram) the patient must make sure that they read the prescription labels well, including those of nonprescription products, making sure to avoid medications with an alcoholic content. However, before consuming Antabuse (Disulfiram) they must consult their health care professional or pharmacist if they are unsure about the alcoholic content present in that particular medication or in any other that they may be taking simultaneously. 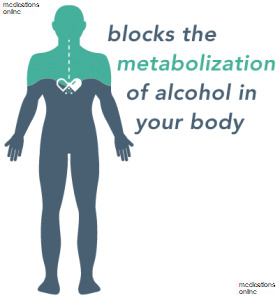 Antabuse (Disulfiram) is used to treat chronic alcoholism and must be used by a patient in combination with supportive therapy, counseling and guidance from one`s trusted health care professional. This medication must never be used without a patient`s knowledge. Antabuse (Disulfiram) is not a cure. It is still uncertain whether health care professionals can prescribe this medication in the case of cocaine dependence as well. Furthermore, Antabuse (Disulfiram) prevents the breakdown of dopamine. Dopamine is a neurotransmitter whose release is stimulated by cocaine. This medication causes an excess of dopamine, which results in increased anxiety levels, an increase in blood pressure and restlessness. Be sure to consult your health care professional or pharmacist for more information, since Antabuse (Disulfiram) is sometimes prescribed for other uses. In case of an overdose of Antabuse (Disulfiram), call your local poison control center at 1-800-222-1222. If the victim has collapsed or is not breathing, call local emergency services at 911. Be sure to carry an identification card with your name, the type and dose of the particular medication you are taking, identification of your condition and the details of your health care professional (name, address and contact number) in case of an emergency. You must also be sure to keep all appointments with your health care professional and the laboratory. Your health care professional will order certain laboratory and/or medical tests to be performed to check your response to Antabuse (Disulfiram), monitor your progress and check for side effects. Do not let anyone else take your medication and ask your health care professional or pharmacist any questions you have about refilling your prescription. While on an ongoing course of Antabuse (Disulfiram) if you notice any of the symptoms listed below, or any other symptoms which may seem severe or persistent, you must contact your health care professional. Sometimes, Antabuse (Disulfiram) may cause the patient to experience unusual weakness, rashes, disorientation, drowsiness, irritability, palpitations, mild headaches, fatigue and dizziness. Furthermore, Antabuse (Disulfiram) may cause the patient to experience restlessness, acne, a loss of appetite, nausea, vomiting, mild stomach pain, cold sweats, excretion of dark urine and a tingling sensation in their hands or feet. If you are on an ongoing course of Antabuse (Disulfiram) before you commence taking any new medication (either prescription or OTC), you must first consult your health care professional or pharmacist. Furthermore, you must be sure to inform your health care professional if you are allergic to Antabuse (Disulfiram) or any other medication in any other form. Your health care professional must also be informed if you are taking any other medication in any other form whilst on an ongoing course of this medication. Sometimes, Antabuse (Disulfiram) interacts with various medications, such as Carbamazepine, Doxercalciferol, Chlorzoxazone, Theophylline, Amprenavir, Fluconazole, Propranolol, Cimetidine and cocaine. Furthermore, Antabuse (Disulfiram) interacts with various medications, such as Phenytoin, Sertraline, Rifampin, Quinidine, Isoniazid, Warfarin, Amitriptyline, Morphine and alcohol. It is important that you do not take a double dose of Antabuse (Disulfiram) to make up for a missed one, unless you have consulted your health care professional.